Standard SAP Business One functionality is used to process both SOPI and SOTPI Deliveries for SPS Cloud EDI. To process SOPI or SOTPI Deliveries, Right-click on the Delivery document to open the Packaging Slip module. From here, see the details outlined for SOPI or SOTPI, depending on which type of delivery is required. To process deliveries for packing, open the Packaging Slip module by right-clicking on the Delivery document, as indicated above. SOPI Deliveries will result in an ASN document that has one shipment level, which may contain one or more pack levels, each of which contains one or more item levels. If the same item is packed into more than one package it must be repeated once for each package, and the quantity in each case is that which is contained within the package. Labels will be printed for each package. Packaging Slip module for packing (SOPI), as described below. This may be entered manually, or you can auto-generate UCC-128/SSCC-18 number. 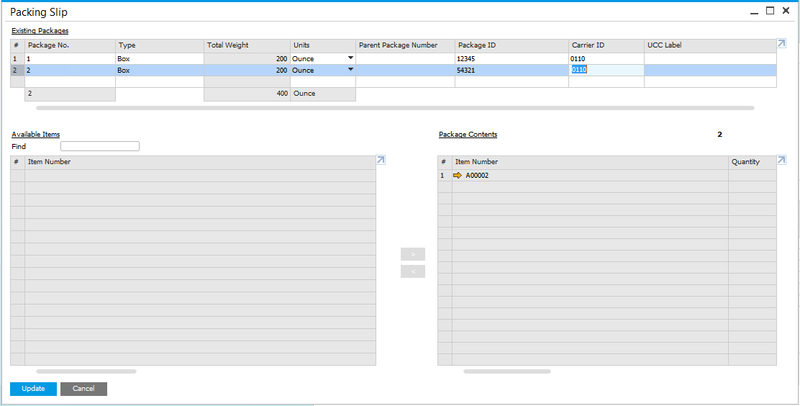 SOTPI Deliveries will result in an ASN document that has one shipment level, which may contain one or more pack levels, each of which contains one or more item levels. 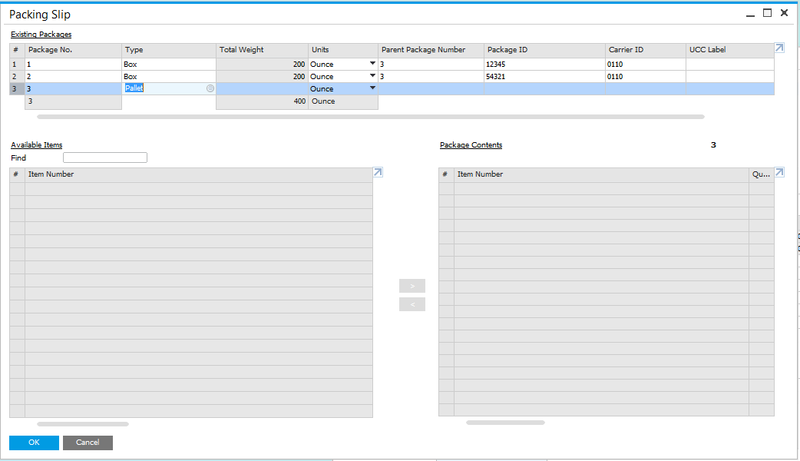 Packaging is similar to SOPI deliveries except that packages can be grouped in one or more pallets using the ParentPackageNumber. Packaging Slip module for packing (SOPTI), as described below. Used for grouping packages for SOTPI deliveries.